Oztec machines can shred over 40 standard letterhead sheets and even eat a few paper clips flavored with staples and not get indigestion. Powerful, fast, and maintenance free, Oztec offers four shredder models and five different stand combinations, providing unequaled performance and flexibility for your specific needs. 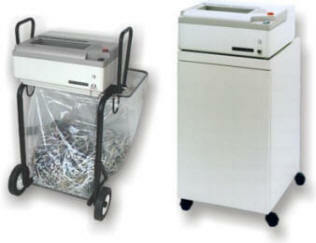 Satisfy your company's document disposal requirements with a no nonsense shredder from Oztec. Designed and manufactured at Oztec, Long Island, New York, USA.